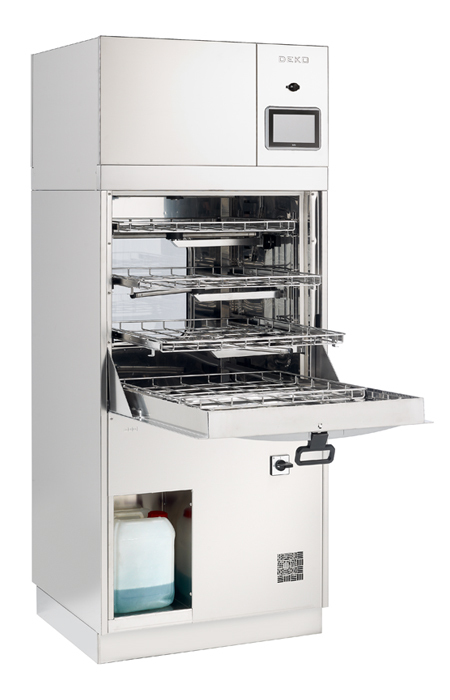 The DEKO 2000ix is designed and constructed to meet the performance and design requirements stated in EN ISO 15883-1 Washer-disinfectors – Part 1: General requirements and in Part 2: Requirements and tests for surgical instruments, anaesthetic and respiratory equipment, hollowware, utensils, glassware etc., as well as, the safety requirements stated in IEC 610102-40: Particular requirements for washer-disinfectors used in medical, pharmaceutical, veterinary and laboratory fields. 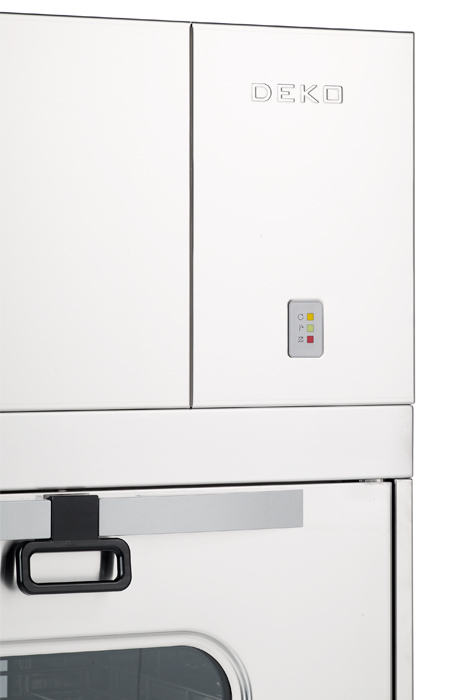 Deko-2000ix is available as a single door or pass through model, with or without a dryer. The structures are made of stainless AISI 304 and acid-resistant AISI 316 steel, and its components selected on the basis of stringent tests. In addition to durability, efficiency and dependability, special attention is also paid to the many-sided and troublefree performance of the machine. 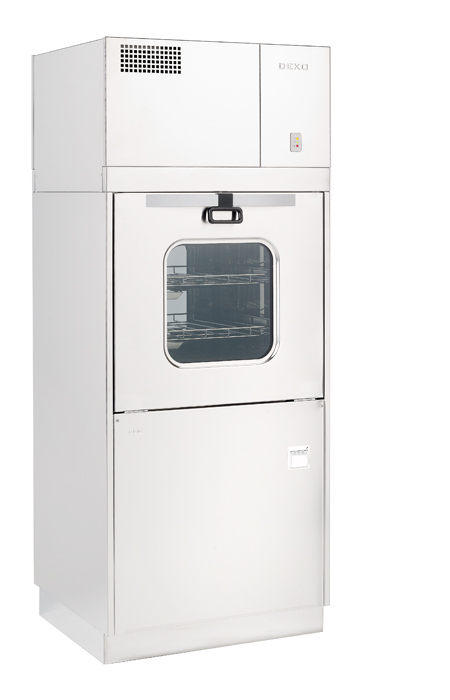 The DEKO 2000ix occupies its space eﬃciently. One unit requires only W800mm x D710mm of floor space. Connections to water, electricity, drain and ventilation are provided with all necessary safety features. Regular control & maintenance of the machine is made quick and easy by the service mode of the PLC and easily accessible components. Water is taken into the chamber directly to avoid separate cleaning and disinfection of integrated water holding tanks. The DEKO 2000ix is manufactured by polished stainless AISI 304 stainless steel, it is easy to keep clean and can withstand continuous use. Galvanised and painted metals and other non-compatible materials are totally avoided in the manufacture of the DEKO 2000ix. Special attention has been paid to sound and heat insulation by using double sheet constructions and the most eﬃcient and environmentally friendly materials. Durability and reliability in continuous, heavy and busy institutional operating circumstances have been the key factors in the design of the DEKO 2000. The DEKO 2000ix is equipped with a Programmable Logic Control system. The user interface with a graphic display provides clear instructions and information on the operation and on-going cycle. Pass-through models have in addition also indicators at the unloading side for on-going cycle, process completed and fault. The advanced control system allows setting up practically an unlimited number of tailored programs. There is an option of 6+6 most commonly used cycles available at the touch of a button and a cycle memory library with scroll selection. Process parameters are protected by special codes and a number of tested and approved cycles can be set fixed, only to be altered by the manufacturer. Use of the machine solely by authorised and trained personnel is facilitated by a 3-level access code system. Accurate instrumentation and the fast processor secure that the circumstances in the process are held within the pre-set limits in order to obtain the required cleaning and disinfection result. Protection to thermo-labile medical devices is provided by double overheating prevention. In order to guarantee that the values of the critical process variables were truly obtained and as programmed, the DEKO 2000 can be optionally equipped with an integrated process verification printer. The 7” TFT Touch Screen Operator and Display Panel can also download cycle data directly through Intranet or saved onto an SD card, i.e. 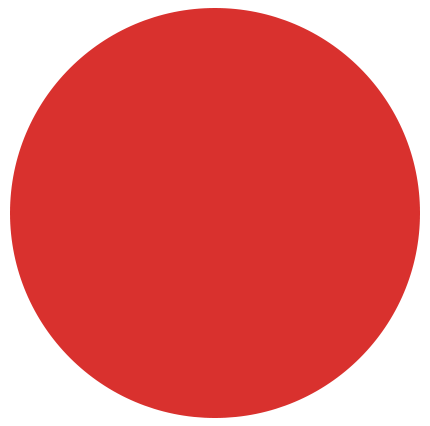 : institution name, date and time, operator and machine identification, cycle number, selected cycle name, phase descriptions, washing pressure, detergent dose stage and volume (option), chamber temperature throughout the process and faults. Security is provided by a three tier password system that allows user, edit and service level access. 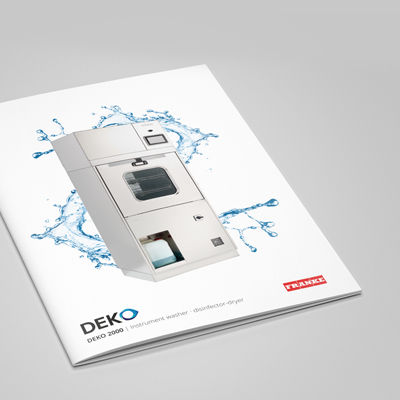 The precise, electronic control of the Deko 2000 saves time, energy and consumables. 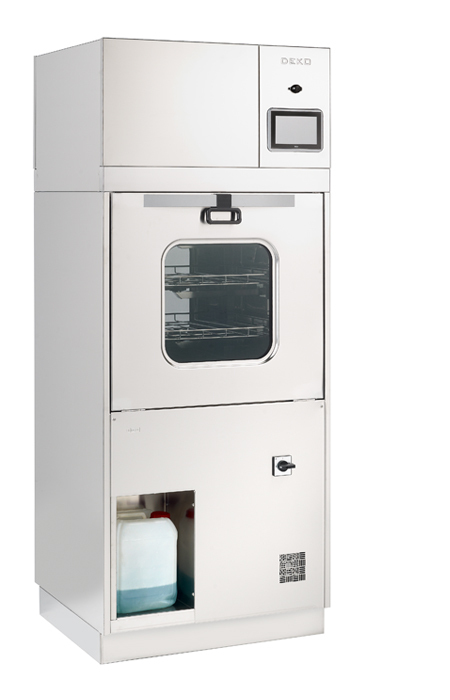 The PLC’s process control and independent recording accuracy are compliant with the most stringent requirements of ISO EN 15883-1 & 2 for instrument washer disinfectors.